Do you need a custom-built command line utility developed to your specifications? Our prices are very reasonable, and automating part of your business is always worth a one time expense! Inquire here. These programs run on all versions of Windows since XP. You may distribute these programs as long as they are not modified or sold. If you would like to package them with a commercial program, please contact us. These programs do not have a graphical user interface. They are meant to run from a command line (DOS prompt), batch file, or shortcut. You should keep your command line programs in a directory on your hard drive, preferably one in the PATH. We recommend "c:\windows\system32\". By the act of downloading and using these utilities, you must agree to the terms of the End-User License Agreement, which can be found here. If you do not agree to the terms, you are not authorized to use our software. STARTAS.EXE - Executes a DOS command line under a different user account. Where foo.bar.bk1 is the most recent backup, foo.bar.bk2 is the next most recent backup, et cetra. Please note that this assumes that backup9 was called 9 times, and the original file changed each time. Where filespec is a specification of the file(s) that should be backed up, and target is the path (drive and folder) where the backup files should be created. /a Always perform backup, even if no change since last backup. /e Replace the source file's extension instead of appending. /i Ignore errors in the file specification. /l Number of backup levels, from 1 to 999 (defaults to 9). /m Maintain the folder structure. This is only applicable with the /s switch and a target path. /q Quiet mode - no banner or operation status. /v Verbose output (detailed information). The filespec can contain the wildcard characters, the asterisk (*) and the question mark (?). It can also include multiple files separated by semi-colons. If the target directory does not already exist, it will be created. If no target directory is specified, the backup files are created in the same directory as the source file. If either the filespec or target parameter contains spaces, it should be enclosed in quotes. No backup is made if the file has not changed since the last backup. If a file is locked, backup9 will retry up to 10 times over a one second period. This is helpful for files that are sometimes briefly locked, like a database. Pressing the Escape key will interrupt the operation. Click here to download version 2.5 of BACKUP9.EXE (released August 4th, 2016). COMBINE.EXE is a program that combines two or more files into a single file. Where target is the name of the new file to be created, and file1, file2, etc. are the "source files" containing the data that is to be combined into the new file. /a Do not overwrite the existing contents of the target file. Instead, append to the end of the target file. /fl The source file is a list of other source files. It can contain one or more filepaths of source files, separated by line breaks or semi-colons. This file can be ASCII, unicode, or UTF-8 (provided that the unicode or UTF-8 byte order mark is present). /lb Before a source file is added to the target file, a line-break will be added to the end of the target file if one is not already present. /nolist Do not list each file. /nologo Do not display the program banner. /nosum Do not display the operation summary. The ? and * wildcard characters are permitted. If no path to the target file is specified, the target file is created in the current working directory. Any filename that contains spaces should be enclosed in quotes. You may press Escape to abort the operation. Filenames containing unicode characters are supported. This creates a file in the current directory named "foo.txt". Its contents will be the combined contents of three files: 1.txt, 2.txt, and 3.txt. Click here to download version 3.0 of COMBINE.EXE (released February 5th, 2015). DELNEXT.EXE will schedule one or more files or directories to be deleted during the next reboot. This is useful for deleting files that are currently in use (and therefore locked). /d The default directory where the files are located. If omitted, the current working directory is used. The directory must follow the /d switch immediately (no spaces), and be surrounded in quotes. /move Instead of deleting, the file specified in this switch will replace the target file during the next reboot. /nologo Don't display the program banner. /now Delete the file immediately if possible. /pause Ask the user to press a key before terminating. The operating system will delete the file before any drivers are loaded or services are started. This makes DELNEXT an excellent tool for ridding a system of viruses. Some viruses will detect when one of their files is missing, and restore it. It is important to delete all of the files associated with the virus. Files cannot be located on a network share because they are deleted before networking support is booted. Directories must be empty in order to be deleted. Deleted files are not moved to the Recycle Bin, they are permanently deleted. For a good undelete utility, we recommend Back2Life. Because the system deletes the file, the presence of delnext.exe is not required. Hence, delnext.exe can be deleted after it is used. This makes it useful as part of a software uninstaller. in the value named "PendingFileRenameOperations". Click here to download version 5.0 of DELNEXT.EXE (released January 22nd, 2015). DELS.EXE will delete a set of files from a directory and all of its subdirectories. Only one parameter is required: a specification of the files to be deleted. The specification can use the ? and * wildcards. Multiple specifications can be separated with a space or semi-colon. Where filespec specifies the file(s) to be deleted. /age## Only delete files that are at least this age, in days. /dif On failure, delete the file during the next reboot. May require admin rights. /nf Don't list each file as it is deleted. /nr Don't recursively enter subdirectories. /ns Don't display the operation summary. /nw Don't report warnings in the file specification. /shred Shred the file so that it cannot be recovered. Complies with NIST SP-800-88 guidelines. /test Test only - no deleting. /xd Exclude each folder that follows this switch. /xf Exclude each file that follows this switch. Deleting F:\PROJECTS\Gammadyne Mailer\Gammadyne Mailer.ncb : FAILED! We are not responsible for damage caused by the use of this program, or any other program, even if it contains bugs. This is a powerful program with the ability to seriously screw up your computer. You may press the Escape key to abort the operation once it has started. When a file specification contains an absolute path, all subsequent file specifications will be relative to that path (but only when using a semi-colon separator). Note that the example above depends on this. Click here to download version 4.0 of DELS.EXE (released April 12th, 2018). DIGSIG.EXE verifies the digital signature of a file. /folder Instead of processing just a single file, processes all files in a folder. Press Escape to abort. 0 The signature is present, and was validated successfully. 1 No signature is present. 2 Failed to find the signature. 3 The signature is present, but the file is not allowed. 4 The file is not trusted. 5 Admin policy has disabled user trust. 6 Failed to link to WinVerifyTrust() in WinTrust.DLL. 7 An unknown error occurred. 8 The file does not exist. 9 The file is locked. 11 A certificate was revoked by the issuer. 12 A certificate is expired. 13 The signature or certificate is malformed. 14 The signature could not be verified. Code 11: A certificate was revoked by the issuer. c:\work\foo.exe : No signature is present. c:\work\bar.exe : The signature is present, and was validated successfully. c:\work\baz.exe : The file is not trusted. Click here to download version 2.1 of DIGSIG.EXE (released September 11th, 2013). Compares file1 to file2, and reports if they are the same size and identical, byte for byte. /e End at specified offset. /f Compare all files in two folders. /ff Only compare files that match the filter (/f only). /i Start at specified offset. /n Compare only the specified number of characters. /nr Don't recursively compare subfolders (/f only). /sdo Only compare files if they have the same date (/f only). /snp No error if one of the files has no counterpart (/f only). 21 files had different dates. 4 files had no counterpart. The %ErrorLevel% environment variable will contain 0 if the files match, 1 if they do not, or 2 if a file could not be opened or read from. Click here to download version 4.3 of FCMP.EXE (released June 8th, 2018). FIREWALL.EXE is a utility for adding exceptions to the Windows Firewall. app/port The filepath to the application's executable, or the port number. name Name of the application as it appears in the firewall manager. /aa Add an application exception. /ad Discard an application exception. /pa Add an port exception. /pd Discard a port exception. /s Report the firewall's status. /udp For port exceptions, allow the UDP protocol instead of TCP. firewall /aa c:\work\foo.exe "Acme Utility"
firewall /pa 14337 "Acme Utility"
firewall.exe must have admin rights to manipulate the firewall. This utility does not work with other firewalls, only the one built into Windows. Click here to download version 2.0 of FIREWALL.EXE (released October 24th, 2016). GPATCH.EXE will alter a block of bytes in a file. The /s switch, immediately followed by the data, inside quotes. The data is expressed literally. The /h switch, immediately followed by a string of hexadecimal pairs, inside quotes. Each hexadecimal pair corresponds to a single byte of data. Each pair can be separated by spaces, commas, dashes, or nothing at all. In addition, you may optionally specify the /n switch, immediately followed by the number of bytes that is to be deleted at the specified index before the data is inserted at the index. If this switch is omitted, this defaults to the length of the data, which has the end result of overwriting a section of the file without modifying its size. If the /n value is less than the length of data, the file will grow. Likewise, if the /n value is more, the file will shrink. If /n0 is specified, the data is effectively inserted into the file at the index. To append the data to the file, specify the /a switch instead of /i. You may specify multiple /s and /h switches. The final data will be the concatenation of the data specified by each switch. Multiple files can be patched at the same time. Either list each file, separated by semi-colons. Or, use the * or ? wildcard. The /r switch will recursively enter sub-folders looking for filename matches. The /nologo switch will omit the program banner. The /nw switch will suppress warnings in the file specification (such as "File does not exist"). Example #1: Changing the 3rd, 4th, and 5th bytes to "abc". Replaced 3 bytes at index 2 in file "f:\g\foo.txt" with "abc"
Example #2: Inserting "abc" at the beginning. c:\dos>gpatch f:\g\foo.txt /i0 /n0 /h"6162 63"
Replaced 0 bytes at index 0 in file "f:\g\foo.txt" with "abc"
Example #3: Appending "abc" to the end. Replaced 0 bytes at index 4 in file "f:\g\foo.txt" with "abc"
Example #4: Deleting the first 100 bytes. 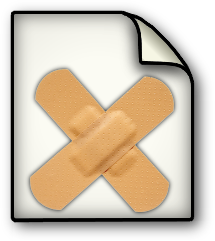 c:\dos>gpatch f:\g\foo.txt /i0 /n100 /s""
Replaced 100 bytes at index 0 in file "f:\g\foo.txt" with ""
Example #5: Patching multiple files. c:\dos>gpatch f:\g\foo?.txt;bar.txt /i0 /n100 /s"abc"
Replaced 100 bytes at index 0 in file "f:\g\foo1.txt" with "abc"
Replaced 100 bytes at index 0 in file "f:\g\foo2.txt" with "abc"
Replaced 100 bytes at index 0 in file "f:\g\bar.txt" with "abc"
Click here to download GPATCH.EXE version 3.0 (released May 31st, 2017). GS.EXE is an alternative DOS shell, with improved editing features, command history, and support for Aero Glass. Pressing the left arrow key does not perform a backspace, it lets you go back and change something without destroying everything that came after it. Pressing the up and down arrow keys will cycle through a history of past commands (including commands from a previous session). Pressing the insert key will toggle the editing mode between "insert" and "overwrite". Ctrl+V will paste the clipboard into the command line. Pressing F7 will display the command history. You can choose a command and press Enter to run it again, or Escape to cancel. Pressing Ctrl+Left or Ctrl+Right will move to the previous/next word on the command line. If the "cd" command cannot find the directory, you will be presented with a list of directories that have a similar name or that have the same prefix. You can then select one of these suggestions. Pressing Alt+Insert will enter "free select and copy" mode. Use the arrow keys to move anywhere in the console. Hold down shift while moving with the arrow keys to select text. Press Enter, Ctrl+C, or Ctrl+Insert to copy the selected text to the clipboard. Or press Escape or Alt+Insert to cancel. The configuration file fo GS.EXE is GS.INI. This file is created the first time that GS runs. Following is a description of each setting in GS.INI. Colors.CurrentPath 15 Color of the prompt (which is the current path and ">"). Colors.CommandLine 14 Color of the command line entered by the user. Colors.Hilite 206 Color of the currently selected directory (when the user is presented with a list). Colors.ExitCode 11 Color of the process exit code (when ReportStatus is 1). Options.ReportStatus 0 If 1, the exit code of a process is reported after it finishes. Options.Glass 0 If 1, the entire background will use the Aero Glass effect. Requires Vista or later. Options.HistoryImmediate 0 If 1, upon selecting a command from the history, the command is executed immediately. Otherwise it is necessary to press the Enter key. Options.NoHistory 0 If 1, the command history is not recorded between sessions. Options.NoRedirect 1 If 1, the File System Redirector will be disabled. GS will view the file system as a 64-bit app, even though it is 32-bit. Options.Transparency 0 The transparency of the console window (from 0 to 255, where 0 is completely opaque). Please note that if Glass is enabled, this transparency is additive to the transparency that is inherent with Glass. Unfortunately it is not possible to reduce the transparency of Glass. A color code is formed by adding a foreground color value to a background color value. For example, if you want yellow text on a blue background, the color code would be 14 + 144 = 158. Click here to download version 9.2 of GS.EXE (released October 9th, 2018). NUMLINES.EXE will count the number of lines in a set of plain text files. It will also count the number of lines containing actual code (assumes comments are in C++ style). Where filespec is a specification of the files whose lines are to be counted. The specification can use the ? and * wildcards. Multiple specifications can be separated with a semi-colon. /bom Report if each file is ASCII, Unicode, or UTF-8. /i List each individual file. /lo Only report number of lines. /nc Don't look for C++ comments. /pause Force the user to press a key before terminating. Report date: 1/21/2017 11:21:08 a.m. The number of lines of code is a poor indicator of the quantity and quality of a programmer's work. In fact, a programmer's skill is inversely proportional to the number of lines of code used to solve a problem. Bad programmers often copy blocks of repetitive code instead of eliminating the repetition with functions. Click here to download version 7.0 of NUMLINES.EXE (released January 8th, 2018). PECHKSUM.EXE reports or updates the checksum of a Portable Executable (PE) file, which includes Windows executables and DLL's. /nt Do not alter the file's modification date. /q Quiet mode - suppress all output. /r Report existing checksum only - do not update checksum. The file specification can utilize the asterisk and question mark wildcards. Multiple files can be specified by separating them with a space or semi-colon. The %ErrorLevel% environment variable will contain 0 on success, 1-99 for parameter error, or 100 for failure. Unicode characters in the filepath may cause the operation to fail due to a limitation in the MapFileAndCheckSum() Windows API. Click here to download version 2.0 of PECHKSUM.EXE (released June 11th, 2017). SIZEOF.EXE reports the total size of a set of files in bytes, kilobytes, and megabytes. Where filespec is a specification of the files whose sizes are to be counted. The specification can use the ? and * wildcards. Multiple specifications can be separated with a semi-colon. /logo Display the program banner. /n Display the size as an unformatted integer. /r# Return the total size as the process exit code (%errorlevel%). 0=bytes, 1=KB, 2=MB. /w Suppress warnings in the file specification. /e Exclude files that follow. Click here to download version 3.0 of SIZEOF.EXE (released August 22nd, 2016). SLEEP.EXE will make the computer enter a power-saving state. By default, SLEEP.EXE makes the computer enter "suspend" mode. The state of the operating system is stored in RAM, which will remain powered. The advantage to this mode is that the computer can be woken up quickly. Pressing any key will bring the computer back to normal operation. SLEEP.EXE can also make the computer enter "hibernate" mode by specifying the /h switch. The state of the operating system is stored on the hard drive. The computer will take much longer to wake up than "suspend" mode, but because there is no need to power the RAM, almost no electricity is used. It is necessary to press the power button to wake the computer from hibernation. /f Force the computer to sleep. Otherwise, any running application will be able to prevent the computer from sleeping if it so chooses. /h Hibernate instead of suspending. Go here for an explanation of how to enable hibernation. /nologo Suppress the title banner. /nr Don't report the current power status. /ns Prevent entering sleep mode. The power status will still be reported. /r Reboot instead of suspending. /w# Wait for the specified number of milliseconds. This does not enter sleep mode, it simply pauses before the sleep.exe process terminates. SLEEP.EXE uses the SetSuspendState() API function in Kernel32.dll. SLEEP.EXE works on Windows 98/ME/2000/XP/2003/Vista/2008/7/8/2012/10. It does not work on NT through version 4.0. 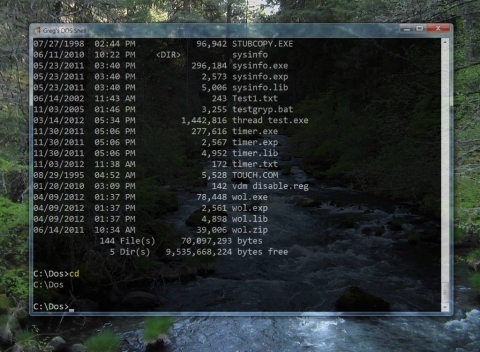 Click here to download version 2.4 of SLEEP.EXE (released April 29th, 2014). STARTAS.EXE will execute a DOS command line under a different user account. /dir Set the current working directory for the process. /hide The process's window should be initially hidden. /profile Load the user's HKEY_USERS registry key. /max The process's window should be initially maximized. /min The process's window should be initially minimized. /w Wait until the process terminates. The user name can optionally be in the form of "user@domain". Everything after the password is considered to be the command line to be launched. Do not enclose the command line in quotes. The command line is executed in a separate console window. Click here to download version 2.0 of STARTAS.EXE (released June 17th, 2017). TIMER.EXE is used to measure the length of time that other command line operations take to finish. When executed with no parameters, the timer is started. If the "/s" switch is specified, the elapsed time is output to the console. /et When stopping the timer, display the current date and time. /q Quiet mode - do not report current time when starting timer. /r Report the elapsed time without stopping the timer. /reset Delete all existing start times. /s Stop timer and report elapsed time. /sw Stopwatch mode: stop the timer when a key is pressed. Timer started: 8/27/2010 2:27:17 p.m. The file TIMER.TXT is used to record the time that the timer started. This file is created in the same directory as TIMER.EXE. Each call to TIMER.EXE without the /s switch should be balanced by one call with the /s switch. Nesting is supported. Click here to download version 4.0 of TIMER.EXE (released July 11th, 2017). WOL.EXE is a utility that turns on a computer remotely. It broadcasts a "Wake On LAN" magic packet to the network adapter with the specified MAC address. The MAC address may optionally be followed by the IP address of the network adapter that should broadcast the packet. A port number can also be specified, although this is rarely necessary. Press Win+X and choose Power Options. Click "Choose what the power buttons do". Scroll down to "Shutdown settings" and uncheck "Turn on fast startup (recommended)". The port defaults to 12287 (0x2FFF), but ports 0, 7, and 9 are also common. You may need to open the port in Windows Firewall (for UDP). To find a computer's MAC address, run the MSINFO32.EXE tool that is part of Windows. Navigate to Components > Network > Adapter. It may be necessary to configure your router to forward the WOL port to the computer that is to be woken. It may be necessary to specify the adapter IP in order for the packet to pass through some switches. The ethernet port's "Connected" light may not be lit when the machine is off. This does not guarantee that WOL will fail. Broadcom NIC's have a separate boot agent where WOL is configured. Press Ctrl+S during bootup. Packets cannot be broadcast across the Internet. That's why they call it Wake On Lan, not Wake On Internet. If that were possible, it would be easy to perform a Denial of Service attack on the entire Internet! Want the C++ source code? We will provide the source code if you purchase a license for any of our programs ($17 minimum). After the order is processed, please contact us and let us know that you want it. Click here to download version 2.1 of WOL.EXE (released October 16th, 2017).